If statement is used to execute a particular area of code if and only if the condition is true otherwise code did not executed in given block. In Technical Term If the expression inside the parentheses evaluates to true, the code between the braces run. If the expression evaluates to false, the code between the braces is skipped. This type of if statement is known as inline if. If braces are not there, then only one line executes according to the condition, If the condition is true, executes one line otherwise skip one line, Rest of code will execute. These line of code will be execute. In the above example, condition is not true so that it skip one line of code. Rest of the code will execute properly. Whenever the if statement return false then the else block will be executed. The following example explains the concept of if else block. 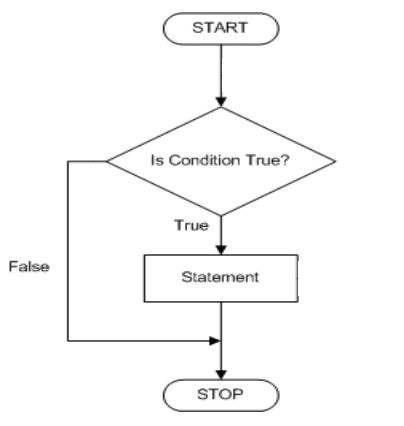 In the above example, the condition is not true so that it skips the one line just after the "if statement" but "else statement" must be executed. You could use braces to execute multiple lines of code, you can put any numbers of line in between braces following example, explain the concept of braces in if or else block. Sometimes an application needs to execute multiple-statement in a single true condition, braces are used to execute multiple statement. In this example, the condition is true, so all the statement in between "if block" will be executed. Else-if statement can be used to conduct a series of condition check. Only execute the code, where the condition met first. echo "your age are :".$a." echo "you are youg boy"." echo "you are middle age  man"." echo "you are old  man"." In above the example rand function generate a random number in between 1 to 50, one condition will be executed according to the generated number. If we write an entire if else construct within the if block or else block. This is called nesting of if else. The second if-else is nested in the first else statement.